NOTE: This tip applies to Windows 10 April 2018 Update (version 1803) and newer. Recently, we wrote a tip about enabling the Emoji panel in Chrome. Today we’re going to show you how to open the Emoji Panel in Windows 10 Version 1803 (and newer) with a Windows key shortcut. And here’s how you do it. Hold down the Windows key and tap the . (period) key. That’s it. 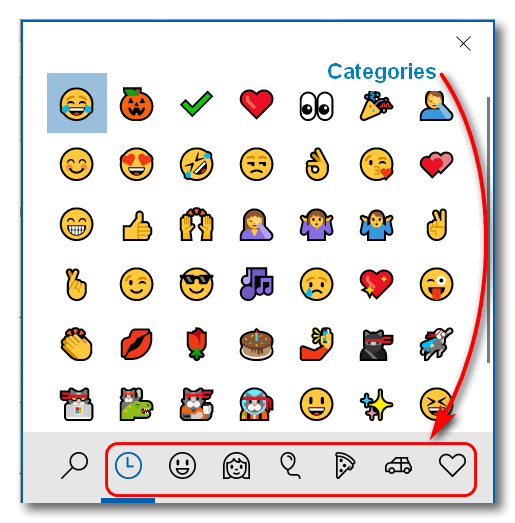 You can try the Windows Emoji in email, forums, Facebook and other social media sites and web pages. They won’t work in all of them, so you try them and see what works. It’s ye olde trial and error method. So easy and it works! Thank you! Well, Yikes! Had forgotten about using the touch keyboard for Windows emojis but reading here reminded me. To my unhappy surprise, now clicking the touch keyboard icon opens a black square with two grey rectangles along the bottom. Any suggestions as to what I may have done to cause this? If the keyboard opens then nothing is wrong with your on screen (touch) keyboard, it’s your shortcut on the taskbar that’s not working right. You can remove it and then put it back. To remove the touch (on screen) keyboard shortcut from your taskbar, right-click the taskbar and uncheck “Show touch keyboard button”. Then, right-click on your taskbar again and select “Show touch keyboard button” .. it should now work. If it doesn’t. right-click taskbar, uncheck “Show touch keyboard button” then restart your PC. After you’ve restarted, right-click the taskbar, and select “Show touch keyboard button”.